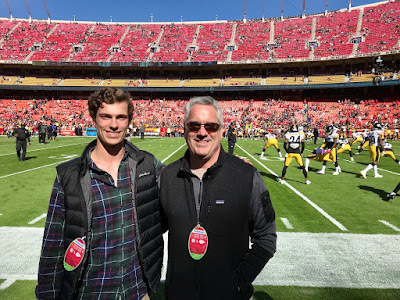 Steeler fans, Ben and his dad, having fun in K.C. During Fall Break, Stedsmen went far and wide in search of a break from their matriculation. As they return, we are beginning to learn about their travels... where they went, what they did and didn't do, and more, much more. 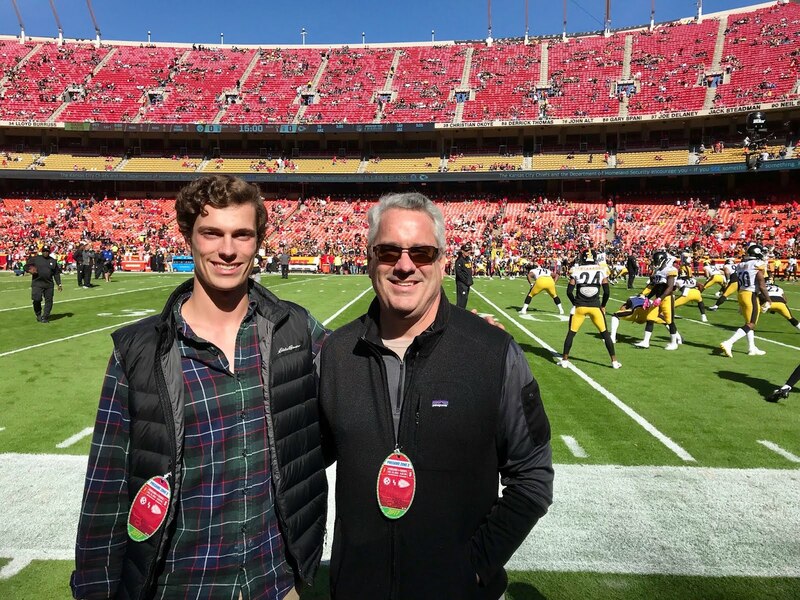 For Ben Merrick, a Steds freshman, break had him traveling to Kansas City to watch his beloved Pittsburgh Steelers take on the undefeated Kansas City Chiefs. On his visit to Kansas City, Merrick said, "My visit to the Arrowhead Stadium to watch the Pittsburgh Steelers play the Kansas City Chiefs was quite thrilling. Despite it being labeled as the loudest stadium in the world, it was very quiet after my favorite team, crushed the Chiefs. As cliche as it may sound, the game was like taking candy from a baby. I had a great time watching the game with my dad and representing St. Edwards Hall on my trip!"" Prior to the start of the game, Ben and his dad were able to visit the game field as players warmed up. And it was during that visit Merrick had the opportunity to speak with Antonio Brown, Pittsburgh wide receiver and punt returner. Merrick asked Brown his signature question "How's Bussiness?" Watch the video below and listen closely, and you can hear Brown's signature response of "Boomin!" To see Merrick's video, click HERE.